The New Products Showcase at the SEMA Show provides exhibitors with an outstanding opportunity to introduce new products, packaging and merchandising displays to industry buyers and media. This sign will be positioned adjacent to each product on display. Additional Publicity—Products in the Showcase will be photographed by our team of professional photographers. Photographs will be featured in SEMA News and www.SEMAphotos.com. They will also be promoted to the media and available to buyers at the Show. All SEMA Show exhibitors are invited to include their products in the showcase. Products that meet the New Product criteria may qualify to receive additional benefits, including the eligibility for a New Product Award. For the purposes of this program, a New Product is defined as one that is manufactured or exclusively distributed by a company exhibiting at this year’s SEMA Show, was introduced to the marketplace after last year's SEMA Show, and is available for shipment within 90 days after the close of this year's SEMA Show. Products not meeting the above criteria may be entered as a Featured Product and will be displayed in the Showcase. Featured Products are not eligible for a New Products Award. 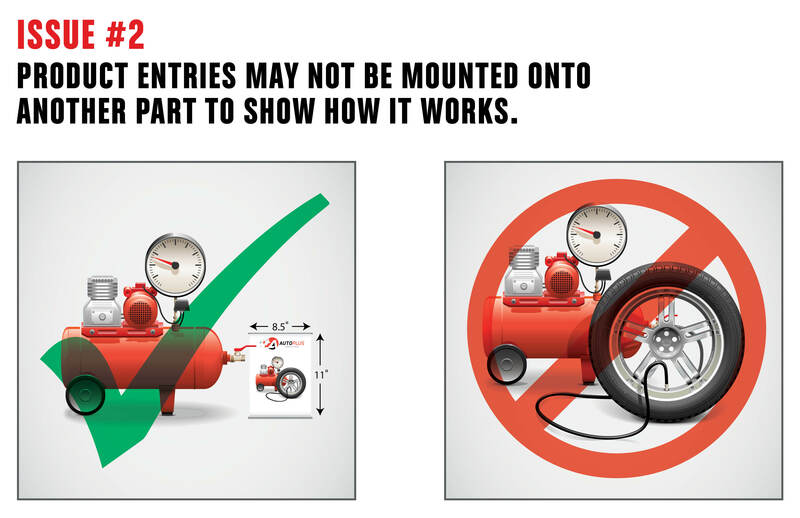 Prototypes, mock-ups and vehicles are not allowed. The first product entered in one category in the New Products Showcase is free, all additional entries are $75 per product category before October 11, 2019 and $150 per entry thereafter. Entries submitted on-site will be accepted on a space-availability basis. No refunds will be provided after October 11, 2019. Exhibitors must check-in their products themselves by bringing the product with them to the Show or shipping the product to the Freeman warehouse in advance. Pre-shipped products must be received at the Freeman Warehouse by October 23, with the shipping label (link provided in the New Products Showcase Entry Confirmation email) affixed to each box. Pre-shipped products will be delivered to the Showcase area on Saturday, November 2, where they must be collected and checked in by a representative of the exhibiting company. Exhibitor must supply one product display for each New Product category entered. Each entered product must also be displayed in the exhibitor's booth. Unless otherwise permitted below, no additional exhibitor-provided signage will be allowed. Assembled product displays and any shipping containers may be no larger than 68" Wide x 80" High to be displayed in the New Products Showcase. Larger products or products\containers requiring a forklift for handling will not be able to be displayed or stored in the New Products Showcase. Alternatively, a display board may be displayed in place of products larger than 68" Wide x 80" High. This display board may be no larger than 22”x28”, must be self-standing, and cannot contain any marketing, advertising or sales copy. Show Management reserves the right to remove any signage not meeting these requirements. Large products may be placed on the floor or a tabletop display, depending on size and space-availability. Please bring bulk items pre-assembled, the way you would like them displayed. This will greatly minimize your check-in time onsite. The product may not be mounted onto another part to show how it works. However, a single photo may accompany a product in the Showcase. The photo may be no larger than 8 ½”x11” and must be provided with an easel or standing frame that is not larger than the photo. The photo may only show usage or application of the product and may not contain any marketing, advertising, sales or description copy. Show Management reserves the right to remove any photo not meeting these requirements. Please note: tires entered into the Tire & Related category may be mounted on an unbranded wheel, or a wheel from one of our confirmed exhibitors. 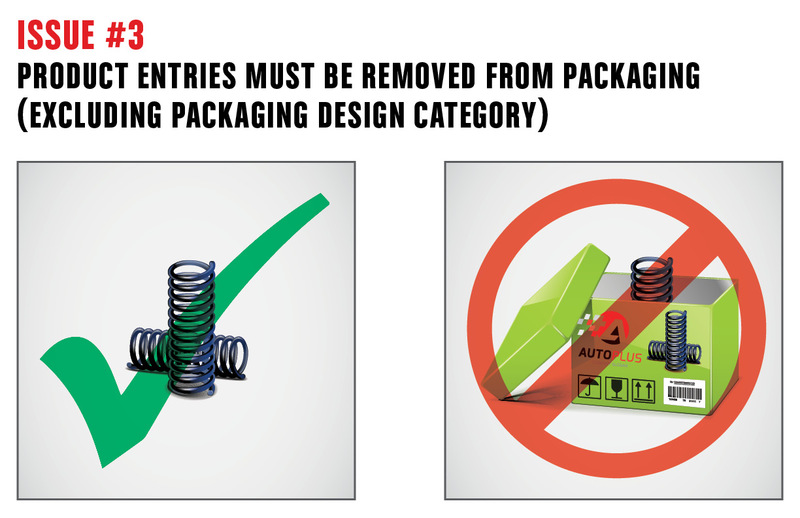 Except when the product is entered into the Packaging Design category, the product must be removed from any and all packaging. A small display stand is permitted. Products that contain small parts or multiple pieces must be mounted on a display board. The product should fill the entire display board and not take away from the product being displayed. The only graphics permitted on the product display board or stand are company or brand name and logo. No marketing, advertising, sales or description copy will be allowed. Show Management has the right to disallow or remove any displays. 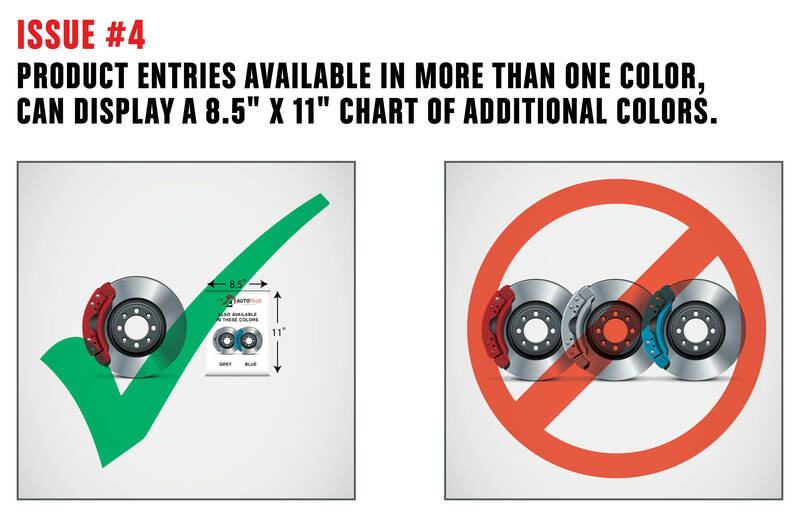 Due to display space limits, if your product is available in more than one color, finish, size, or fitment you may display it only in one color and provide a separate chart (no larger than 8 ½”x11”) of additional colors, finishes, sizes or fitments may be displayed next to the product. The chart cannot contain any marketing, advertising, sales or description copy. Exhibitor must provide an easel or standing frame no larger than the color chart. Show Management reserves the right to remove any chart not meeting these requirements. Products with movement are permitted with Show Management approval, as long as the movement pertains to the usage of product and does not create a safety hazard. A rendering, description and dimensions of the displays involved must be e-mailed to newproducts@sema.org prior to the Show for approval. Software and Applications may be displayed on a laptop, tablet, or mobile device. Entrants must arrange for their own electrical power for each individual display through Freeman (702-579-1700). Devices must be self-contained and set to run for the entire Show. Running presentations must only demonstrate the product and may not include sales or advertising content. Devices must be set to a demo mode and may not be interactive. The SEMA Show, the New Products Judging Task Force and Show Management are not responsible for any loss or damage to equipment or software on display. Show Management reserves the right to prohibit presentations deemed inappropriate at their sole discretion. Products that are digital in nature (i.e. GPS unit, ECU tuner, diagnostic tool, etc.) may include a single sign explaining the programming and/or functionality alongside the product. Such signage may not exceed 8 ½”x11” and exhibitor must provide an easel or standing frame no larger than the signage itself. This signage cannot contain any marketing, advertising or sales copy. Show Management reserves the right to remove any signage not meeting these requirements. Exhibitors can pick up their product displays on Friday, November 8, 3-8p. Only hand carry items, or items that can moved with a 2-wheel cart can be moved on the Show floor until 4p. Product displays and containers requiring a forklift or electric pallet jack may be delayed until the Show floor is cleared of vehicles at the close of the Show. Exhibitors also have the option to have their New Product(s) packaged and shipped back by UPS at the end of the SEMA Show. Instead of exhibitors returning to the New Products area on Friday afternoon, they can arrange during check-in, or at one of the UPS locations on the Show floor, for on-site UPS personnel to handle this. UPS return shipments must be arranged through the Official SEMA Show UPS Store to take advantage of this service. Products not picked up by noon on Saturday, November 9 will be considered abandoned. Show Management will not be responsible for return of abandoned products. New Product entries submitted by SEMA and TIA member companies that are checked-in before 10a on Monday, November 4, 2019 will be included in SEMA’s annual New Product Awards competition. The competition recognizes outstanding achievements in the development of products being introduced to the specialty automotive aftermarket at the SEMA Show. Award winners are announced on Tuesday, November 5 at the New Products Awards Breakfast, and are also recognized at the annual SEMA Industry Awards Banquet on the evening of Thursday, November 7. There are 16 award categories in which products will be judged. Each category will have one winner and two runners-up. A company may enter as many eligible products in each category as it wants, and is eligible to win awards in more than one category. **Entries in the Performance—Street Product category must make provisions for all required emissions controls. 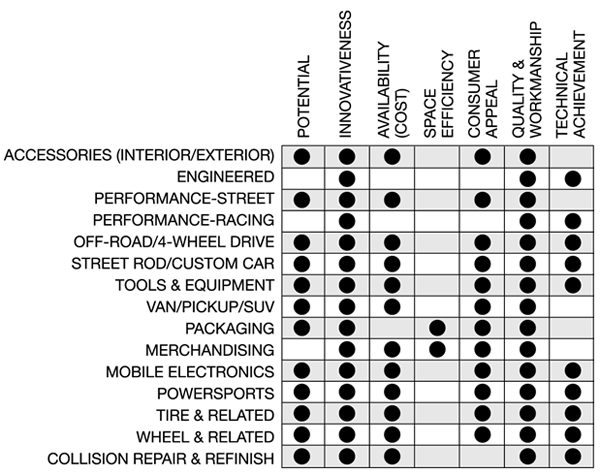 Other emissions-related products should be entered in the Performance—Racing category. ***Products entered in this category should complete the description noted for Packaging or Merchandising Category. To be eligible to win a New Product Award, the exhibiting company entering the product must be a SEMA or TIA member in good standing. Engineered New Product—Must be identified as an engineering achievement that focuses attention on a product that demonstrates innovative engineering development, and advances the state-of-the-art technology in its particular field. Evaluation shall include whether or not the engineering achievement was accomplished without over-complication of the product, efficiency in design, practicality and ease of assembly and installation, and ease of service. Over-design or under-design will be considered, and each product should be complete, as compared to instructions and a starter kit which requires further work by the owner (end-purchaser/customer). Merchandising Display—A Merchandising Display is defined as a point-of-purchase display that physically shows or holds actual merchandise; e.g., counter cards, gondolas, life-size stand-ups, free-standing trays, rack variations, etc. 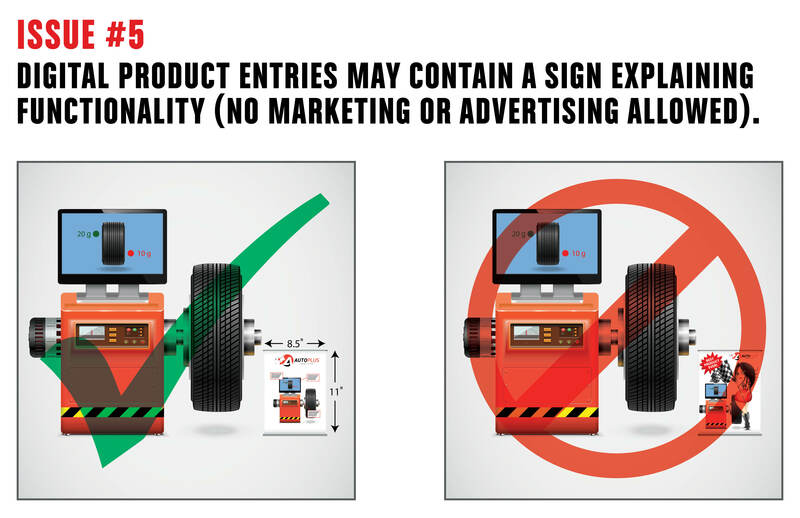 Posters, signs, decals, brochures, and printed literature are not considered merchandising displays under the criteria relating to marketability and consumer appeal. While the criteria herein are designed to exclude such things as posters, etc., it is recognized there may be a fine line in the exhibitors' (and judges') minds with regard to what is a merchandising display. For this reason, if you feel your company has a product display that is a merchandising display, you may enter that and let the judges render the final decision. Companies with products or services that cannot physically be displayed may provide a poster or flyer no larger than 8 ½ x 11” mounted on rigid material with an easel back. Copy is restricted to photos and product/service details and technical information. 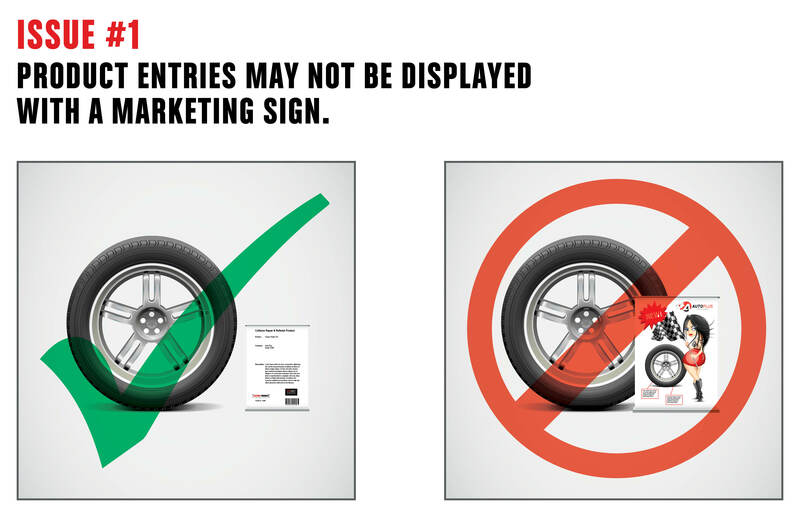 Signs that include marketing statements, i.e. BEST IN THE INDUSTRY or the like will not be accepted. The word “New” in judging entries shall primarily mean innovative. A product shall be deemed new when it is new to the industry, not new to the exhibiting company. Entries, not companies, are the objects of judging. Judging will take place on Monday, November 4. Products must be fully checked-in by 10a on Monday, November 4 to be eligible for judging. Judging is based solely on the merit of the entry. Judges may determine by majority vote that no entry in a particular category is qualified to receive an award. In this event, no award will be given in that category. Winners and runners-up in each category will be announced at the New Products Awards Breakfast, Tuesday, November 5 and will be recognized at the SEMA Industry Awards Banquet on Thursday, November 7. Winners will be contacted on the evening of Monday, November 4 to confirm the award and ensure that a representative will be present at the New Products Breakfast to accept the award trophy. Plaques for runners-up will be presented in the Media Center on Tuesday, November 5, 3-4p. While security is provided at the New Products Showcase, SEMA and Show Management cannot accept any responsibility for entries. By completing the entry form, you expressly waive and release SEMA and Show Management, their respective directors, officers, employees, agents and/or servants from and against any and all liability for damage, destruction or loss of the entry submitted to the New Products Showcase or any consequential loss or damage whatsoever. Freeman will handle all labor within the New Products Showcase. If your product requires a cart or labor for check-in, please complete the Labor Order form located in your Exhibitor Manual. Carts will be provided during check-out on Friday, November 8 until 8 p.m. Installation and the cost of electricity are the exhibitor's responsibility. Contact Freeman at 702/579-1700 to arrange service. Enter your company’s product(s) online at www.SEMAshow.com/newproducts.